Joseph Laquatra was apparently building green dollhouses years before the Green Dollhouse Project. 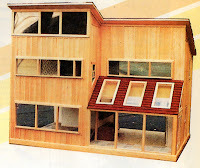 This dollhouse, a contemporary two-story hybrid solar design with an attached sunspace, was built for his niece back in the mid-1980s (she still has the house pictured above). It features six rooms (plus a closet): kitchen, living room, bathroom, two bedrooms and the aforementioned sunspace that can also be used as a greenhouse. The unconventional and cool feature of this dollhouse is the thermosyphoning, liquid cooled solar panels that are fitted in some of the window openings. Although Laquatra is not a dollhouse designer/builder by trade, the passive solar dollhouse wasn’t his only endeavor. Below you can see the first dollhouse he built in 1983. You can obtain the plans to build the passive solar contemporary dollhouse in a copy of the 1986 November-December Workbench Magazine. Where did you find this beauty? Love it! If only I could track down that issue of Workbench Magazine. I found it on ebay. Check the old magazines up for auction. I notice that the dollhouse plans pop up about 1-2 times per year on ebay.